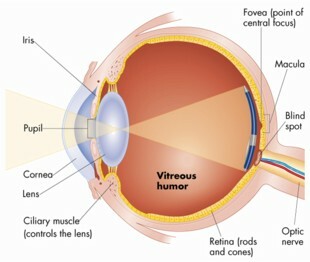 THE human eye is a superb optical instrument tuned to the maximum output frequency of the Sun. This means that night vision is inferior to daytime vision, but there are certain tricks that can be employed to maximise its efficiency in the dark. Rod cells which respond only to light intensity, are highly sensitive and are distributed all over the retina. Cone cells which are responsible for colour vision, are less sensitive and concentrated around the optical centre of the eye. Most of our daytime vision uses the cone cells and is in colour. At night, the available light is too low to stimulate these cells, so we rely on the rod cells. This means that we only see faint objects as tones or shades of grey (monochrome vision). The concentration of rods is greatest a few degrees away from the optical centre of the eye, so in order to see very faint objects it is necessary to use the technique of averted vision whereby one looks slightly to one side of the faint object and becomes aware of its presence indirectly. The hormone rhodopsin must be secreted to enhance the rod cells’ ability to respond. This process may take up to half an hour to achieve full dark adaptation. Once gained, this adaptation can easily be lost through exposure to a bright light source, so astronomers use red torches for sketching/setting up (etc.) because the dark adapted eye is least sensitive to the red end of the spectrum (photographers use the same principle in the darkroom). Rear cycle lights are a cheap and effective solution, especially the LED ones. observation. The novice usually makes the mistake of closing the eye that isn’t being used at the telescope. This causes a squint and eye strain results. Ideally you should keep both eyes open and focused as if you were looking at the horizon, and if the other eye is distracted, wear an eye patch!